The West Wing series was a 60 minute political drama on NBC about the daily operation of the West Wing of the White House. Difficult choices that had to be made by the President and his staff were examined. Their attempts at managing their personal lives while doing a job that demanded nearly all of their attentions was also an interesting aspect of the series. And, perhaps most entertaining, is the conflict that arose between the liberal Democratically run West Wing and its conservative Republican opposition in Congress. There actually was a Josiah Bartlett in real-life. He was a member of the Second Continental Congress from New Hampshire and he even signed the Declaration of Independence! According to the West Wing plotline, he is an ancestor of President Josiah Bartlett! Originally, Martin Sheen was only supposed to appear in 4 episodes of the West Wing TV show per season. Luckily for we fans, he became a regular cast member. 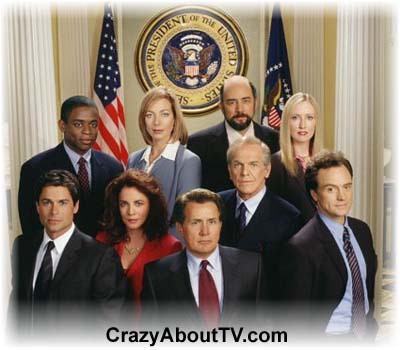 There were several other big name stars considered for the role of the president on the West Wing. Among them were Alan Alda (M*A*S*H), Sidney Poitier and Jason Robards. The West Wing's oval office set is the same one that you saw in the 1995 movie, "The American President". On October 3, 2001, a special presentation of The West Wing was broadcast in reaction to the September 11th terrorist attacks on New York City and Washington D.C. It was the first drama series to air a special episode, totally based on the attack (meaning that the other ongoing plotlines of the series were ignored for that episode). In order to present the show on a timely basis, there were only a couple of weeks between the time that the script began production and the time that the episode aired! Perhaps you remember the strange story that Leo told on a West Wing episode about President Andrew Jackson getting a huge block of cheese as a gift. That story is actually true! The people of New York gave it to him. It sat in the White House food lockers untouched for two years and then was given away again to the citizens of Washing D.C. as a George Washington's birthday celebration gift. The hungry citizens consumed the cheese within two hours! Thank you for visiting our The West Wing page!